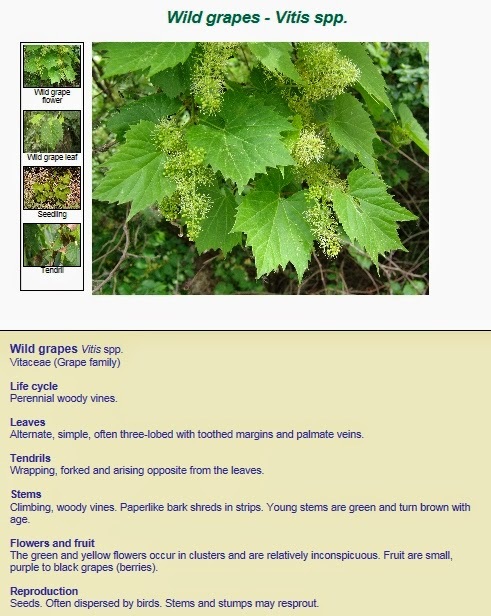 There are more than 50 species of Wild Grapes in the Vitis genus native to eastern and central North America. They grow in woods, on riverbanks and along fence-rows and flower in late spring to early summer. We had a huge fence at our elementary school covered in vines. Fresh, tender leaves to me are the first ingredient to my favorite food, Vegetarian Stuffed Grape Leaves. The vines also produce berries from August until frost which attract a variety of birds and other animals that eat the fruits and disperse seeds.